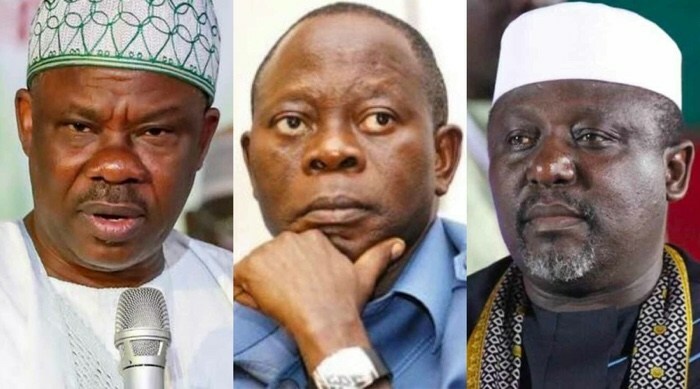 The National Chairman of the All Progressives Congress, APC, Comrade Adams Oshiomhole has explained why the leadership of the party was yet to take disciplinary action against the Governors of Ogun and Imo states, Ibikunle Amosun and Rochas Okorocha respectively. In an exclusive interview with Vanguard, Oshiomhole said the party was taking its time and selecting its priority, given that the elections are around the corner. "It is about taking your time and getting your priorities right. At the eve of election, I am not going to be distracted to sit down and begin to do intra-party trial. I rather take my message direct to the electorate because my focus is to win the next election, why will I waste my time on such issues? "But let me remind you, if you don’t appreciate it, I am already in history as the only Chairman of a governing party who has had the guts to enforce the rule and disqualify two sitting Ministers because I was convinced that they have done some things that are not in line with progressive politics. "And we disqualified them even as sitting Ministers. And even the fact that the party can stand for a candidate that is not backed by a governor. It is a statement of courage. If you don’t readily appreciate that, I do since you are suggesting that I am probably afraid of disciplining them because they are governors. I am telling you, you have to decide whether at the eve of a major electoral contest, whether you want to devote your time to distractions. Go to set up panels to try them because there are procedures for discipline, or you rather devote your time talking to the electorate who are our ultimate employer. "I will rather devote time and resources now, talking to our electorate in Ogun on the need to vote Dapo Abiodun as the next governor of and also talking to Imo State people on the need to vote Hope Uzodinma as the next governor. That will be more productive to me than dissipating energy in sanctioning the two governors now," he added.